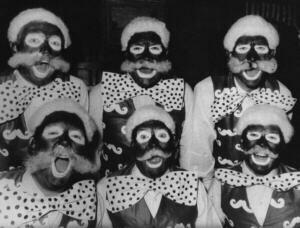 The club was founded in April 1947 in the dressing room of comedian Jimmy Edwards at The Windmill Theatre in London. There were 10 founder members, including Jimmy Edwards, Raymond Glendenning, and Frank Muir. The minutes of that first meeting are in the Club archives and it appears that although there was a goodly number of founder members they were outnumbered by chorus girls! 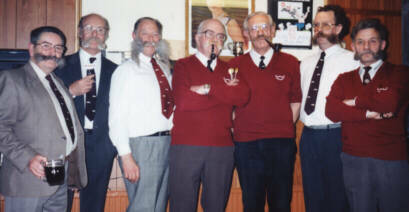 The object of the Club was, and still is, to bring together moustache wearers (beards being strictly prohibited) socially for sport and general conviviality. The aim of the Club was to assist by all means at its disposal, any worthy charity or cause, particularly those devoted to ex-servicemen. This aim still remains today and we have helped particularly with children's charities. The membership peaked at about 200 in the 50's and 60's, and the 'HQ' for many years was the Pathfinder Club. Informal meetings were held on the first Friday in each month, when members could meet in the bar. This procedure is still followed today, for we meet in 'The Windsor Castle' in Crawford Place, just off London's Edgware Road. Quite a lot of social activity, mainly in connection with charity, took place. The Club celebrated its 21st anniversary in 1968 with a "Ladies' Night" at which Jimmy Edwards made his last appearance at an official Club function. We were not "Politically Correct" in 1968! As the Club grew it became necessary to cater for members who were unable to get to 'First Friday' meetings in London and so branches, or as we call them, 'Nests' were set up. Currently there are three of these, in the East Midlands, Sweden and Norway. These Nests conduct their own activities whilst keeping a close contact with the main body of the Club in London. The membership slowly dwindled over the years but in 1980 there was a revival and the administration of the Club was put on a better basis. As a result, about 100 members continued in the Club and this figure has remained fairly constant ever since. In addition, a reasonably regular Newsletter was published, and this has served to keep all Handlebars whoever and wherever they are, informed of Club events. One feature that happened rather than being specifically introduced was that the ladies now attended First Friday meetings. Nowadays, the only sport in which we indulge, is the playing of darts. For a few years now we've been playing against The Pipe Club of London, but neither side takes the game too seriously. Raffles are usually run, with prizes donated by Handlebars, and the proceeds donated to charity. Our 50th anniversary was celebrated by a weekend in Eastbourne, at which we were joined by friends from Belgium, Germany, Holland and Sweden, not to mention a New Zealand television film crew! The weekend included the holding of our 1997 AGM, and the whole event was judged to be such a success that we have held AGM weekends away from London each year since then. In 1998 we were at Leicester, for the convenience of the Nottingham Nest; in 1999 at Banbury, including a visit to Stratford on Avon and a tour of the Cotswolds; in 2000 we visited Boroughbridge in Yorkshire; in 2001 Tonbridge in Kent was the venue, and in 2002 Morecambe in Lancashire. Members from Sweden have joined us each time, and we are pleased when any of our friends from other countries are able to come along. Moustache clubs now proliferate in Continental Europe. 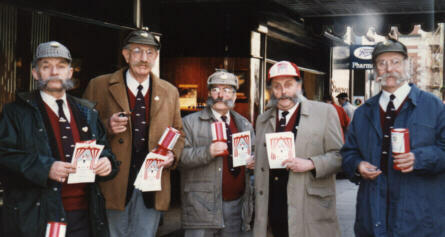 Through the hard work of the late Sten-Erik Molker, at one time our lone Handlebar in Sweden, we gained so many new members in that country that they started a Nest and eventually formed their own national club, the Svenska Mustaschklubben. We also gained one new member in Trondheim in Norway and he quickly recruited some more members, enough to form a small Nest. This Nest then formed the nucleus of a Norwegian moustache club, Den Norske Mustachclub av-91, and by 1997 they were strong enough to host the World Championship of Beards and Moustaches. We were proud to supply the chief judge. Then in 1999 our friends in Sweden organised the next World Championship, at which we were well represented. And in the future we plan to host the 2007 Championships as part of our 60th anniversary celebrations.